Beach Front! Walk to Front St. Lahaina! Private 4 Bedroom Home on Sandy Beach! House, 4 Bedrooms + Convertible bed(s), 2 Baths, (Sleeps 8-12), Hot Tub! 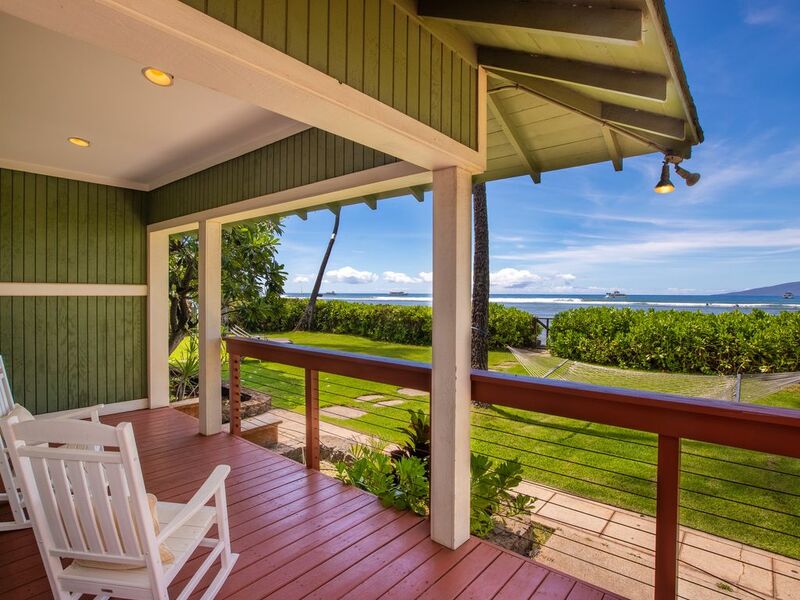 This is the closest beach front home on Front Street, Lahaina, Maui, Hawaii, great for swimming or learning to surf. Located just steps away are the great shops and restaurants of Front Street in Lahaina, where shopping and dining are at your doorstep! The Lahaina Harbor is just 300 feet away where you can go deep sea fishing or just have a sunset cruise! We have a great Hot Tub for those relaxing nights watching the sunset behind our palm trees. For those of you that love to surf, there is a break right in front of the house. Originally built in 1928! Stay in an historic Maui home on your Maui vacation! We now include the Ohana on this property to make it a total of 4 bedrooms and 3 full baths in the two homes for all reservations established after December 1st 2018. This adds 1 additional bedroom and an additional kitchen, full bath and living room. The detached ohana is like a detached in-law suite and ours has a queen size bed in the bedroom and a pull out sofa in the living room. This is perfect for parents, in-laws, nannies or anyone who wants a little extra privacy yet still wants to stay all together on the same property! You get both homes which are about 15 feet away from each other. The main home is a 3 bedroom home and the ohana is a 1 bedroom studio. ** If this home happens to be booked for the dates you would like, we have another home directly next door. Please check the availability of the Surf and Sand Villa, VRBO 200067. Or if you have a large group, and would like to book two side by side beach front homes, please book both VRBO 199283 and VRBO 200067! VRBO 200067 will sleep up to 8 and VRBO 199283 will sleep up to 12! Disclosure: Please note that we do not have control of the natural forces of the ocean and the beach in front of our home may not exist during certain seasonal beach erosion caused by either north or south swells. The beach may change on any single given day and there is no way to predict the forces of nature. There are no refunds or partial credits given due to the absence of the beach in front of the home. The beach however is always present out of the side gate all year round. Please also note that the pictures best represent the home, although they are not entirely accurate as we are always upgrading our home. There is 125 feet of Property touching a white sandy beach. You are able to swim in the ocean right in front of our home. Many people are out year round taking surf lessons directly in front of our home. This is one of the best locations in Lahaina, Maui!! Private Hot Tub, Watch the sunset behind the palms and over the ocean right from the Hot Tub! Super easy logistics in a remarkable location. Was perfect for our group of 7! Nice location, beach is better at high tide. Fantastic place for a family vacation. Perfect location, beautiful home, great ocean view. Beach out back not great for swimming or snorkeling. Would stay again! Only steps from beach. Loved sitting at the bar high table watching waves and sunsets. Comfortable beds. Our family of 6 stayed at this lovely house within Lahaina. I originally chose this location because I was running in the Maui Oceanfront Half Marathon and the finish line was 2 minutes away. I couldn't have asked for a better place to make our home base for all our Maui adventures. Our boys loved to be able to run out to the beach throughout the day and the home even had lots of beach toys for them to use. If we wanted to stay in and cook we had all of the pots, pans, etc. that we needed, and if we wanted to eat out we only had to walk a few minutes down the road. This wonderful home definitely helped make this trip one we'll never forget. This is an Oceanfront Home!